Twelve Saudi women made the cut last month to CEO Middle East magazine’s list of “The 100 Most Powerful Arab Women” for 2012. I intend writing about all 12 in a future post. I was surfing the Internet for information and photos for that purpose when I stumbled on the storyline of a 13th Saudi woman who is not exactly “powerful” as the rest, but certainly innovative and talented. 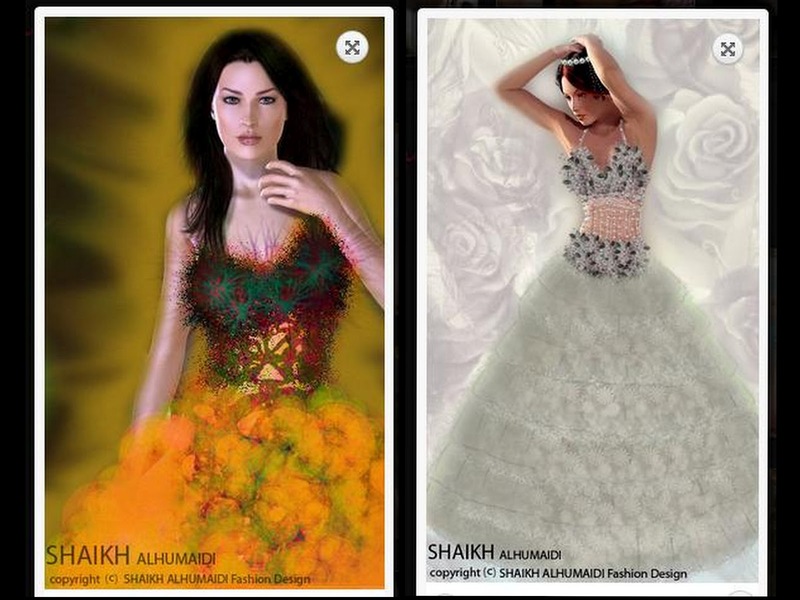 She is Shaikha Al-Humaidi, a Saudi pioneer in digital fashion design. Al-Humaidi, who loved drawing and painting as a child, converted to art, fashion and color mixing when she turned 13. Growing up, she got encouraged by her father’s constant praise for her artwork.” From secondary school onward, she would design her own dresses that she would wear on special occasions. Gradually, family members and close relatives started asking Al-Humaidi to draw (ornate) gowns to be tailored at the local dressmaker’s shop. 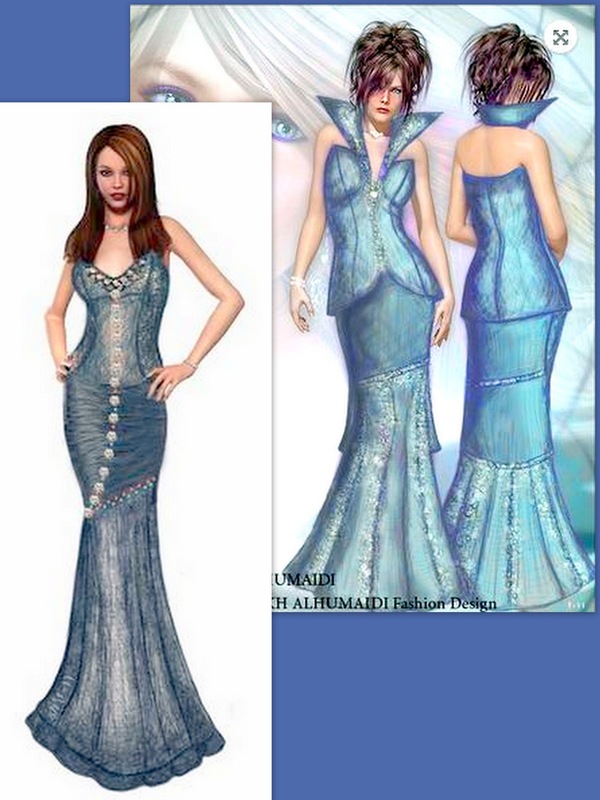 Al-Humaidi says, “After I got married, I continued to create my own dresses. It was my husband who first encouraged me to expand my horizons and to take my talent for design beyond my immediate circle of family and friends. To keep up with her customers’ demands, Al-Humaidi set off to learn everything there is to know about digital designing, the most up to date computer software in the field, fabric textures, embroidery, cutting materials and more. Thus her online fashion design business was born. Al-Humaidi became one of the first Saudi women to design, custom-make, and sell dresses via the Internet. 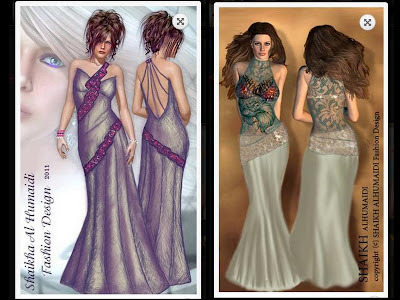 Asked to describe what she does, Al-Humaidi said: “Digital fashion designing is convenient and it saves time and energy for both the designer and the client. What is special about digital designing is that the electronic model of the gown can be easily adjusted and played with until you meet all your client’s wishes and until she is 100 percent satisfied. The young Saudi fashion designer, who is also mother to a little girl, specializes in evening gowns and wedding gowns. She also aspires to launch her own lingerie line. Al-Humaidi believes in empowering other young Saudi women, teaching them the secrets of the trade, and giving them “wings” to fly on their own in the booming industry of digital fashion design. She was one of the first women in any Arab country to offer courses and train other women in this new field, teaching them how to use the software tools for designing. Once her business was up and running, Al-Humaidi decided to open her own “fashion academy” and share with other Saudi and other Arab women her skills in digital fashion design. The talented designer’s next big step is to participate in a star-studded fashion show in Dubai slated for October. She is currently working on several evening gowns to parade on Dubai’s catwalks. All accompanying digital designs are from Shaikha Al-Humaidi’s portfolio. More can be found on her website.